For the uninitiated, Eataly is an Italian-cuisine food hall/wonderland that started in Turin, Italy and spread across the world. There are food stalls, restaurants, and bakeries; it's a beautiful concept that could and should work for every cuisine. Lucky for us, we're about to be blessed with a Spanish equivalent. In short, this Spanish-cuisine palace will be run by three royals of the food world, and it'll be far less intimidating than the words "molecular gastronomy." 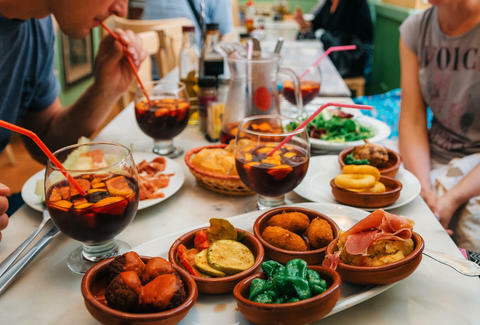 The food hall will feature three restaurants: "a rice-specialized restaurant, a Basque-style grill house, maybe even a traditional Catalan 'granja,' in which you can have a hot chocolate with the classic old-style cakes," Albert Adrià told Eater. He added that we should also expect a market space with stands set up for different products, plus a counter space for a gastronomic bar. In a follow up with Eater Adrià added, "It's our homage to the Spanish cuisine... I can tell you there will be three restaurants and smaller places to taste Spanish specialties, mostly tapas. It will serve coca, the mostly unknown Spanish pizza, which we intend to put on the world's food map, churros, and other Spanish sweet pastries. We will also have a world-class tapas bar, a jamon bar, and a tortilla stand to eat there or to go." The food hall will be located in the Hudson Yards complex in Midtown West in Manhattan and will be open as soon as early 2018. In addition to the whopping 35,000 square feet devoted to this project, Hudson Yards will feature 4,000 residences, plus other restaurants from heavy hitters like Thomas Keller and David Chang. As for the rest of country, if it takes off like Eataly did, maybe there'll soon be one near you. James Chrisman is a News Writer at Thrillist who would like his own version of Eataly. Send news tips to news@thrillist.com and follow him on Twitter @james_chrisman2.